"He liked what I did, so the first two years after I graduated, they had me help out," Friedmann says in the story. A few years later when that announcer moved away, Friedmann took over full time. "This year will be my 37th year," he says in the story. Friedmann’s work as announcer for the Wildcat Band was borne from his interest in radio. "Friedmann’s love of radio persisted through his years as a high school clarinetist and drum major. When it came time to apply to college, he looked at schools with a strong broadcasting program and a good marching band," says Leiser. Northwestern was a natural choice. Friedmann was a radio/television/film major in the School of Communications. In the Wildcat Band, he played clarinet and eventually was chosen as Spirit Leader. Friedmann also participated in two Waa-Mu shows before graduating in 1979. Since then, Friedmann has built a career as a communications consultant, serving a variety of clients through Friedmann Communications, Inc.
"Friedmann does contracted voiceover work, including commercials and public service announcements," says Leiser. "However, his primary job is to help other people get comfortable with public speaking." The Halftime Magazine profile also describes Friedmann’s 2012 appointment as announcer for Northwestern University Women's Basketball. "The athletic department held an open casting call for his successor," says Leiser. 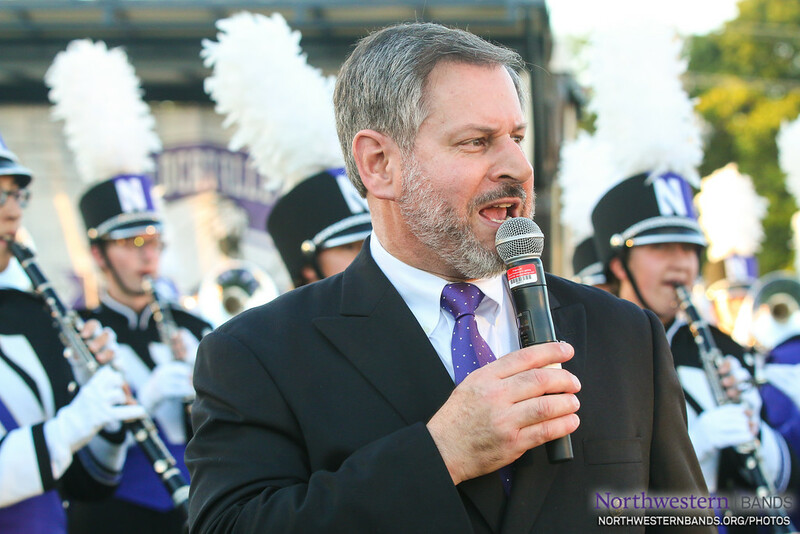 "Dan Farris, Northwestern’s marching band director, encouraged Friedmann — who was a basketball season ticket holder — to audition for the spot. He got the job." Halftime Magazine is the only nationally-circulated magazine reporting on marching bands, drum corps, and similar ensembles, as well as industries and organizations that support them. It was first launched in July 2007 by Christine Katzman ’97, who played flute in the Wildcat Band and is a graduate of Northwestern's Medill School of Journalism. Recent Halftime Magazine stories have covered everything from the Blue Knights Drum and Bugle Corps performances in Bahrain, to a rememberance of Stanbury Uniforms CEO Gary Robers, to an exploration of how Yamaha builds band instruments in China and Japan. The profile on Friedmann concludes with a play-by-play of his game day with the Wildcat Band. "Friedmann announces the pregame and halftime shows, then spends the second half of the game writing the script for the post-game show," says Leiser. "During post-game, Friedmann is known for introducing each song with a rhyme or a poem that reflects the outcome of the game." Read the full story at halftimemag.com, where Leiser also profiles DCI announcer Dan Potter, BOA announcer Chuck Hensen, and Joe Bartko, who announces for the Colorado State University Marching Band and the Blue Knights.